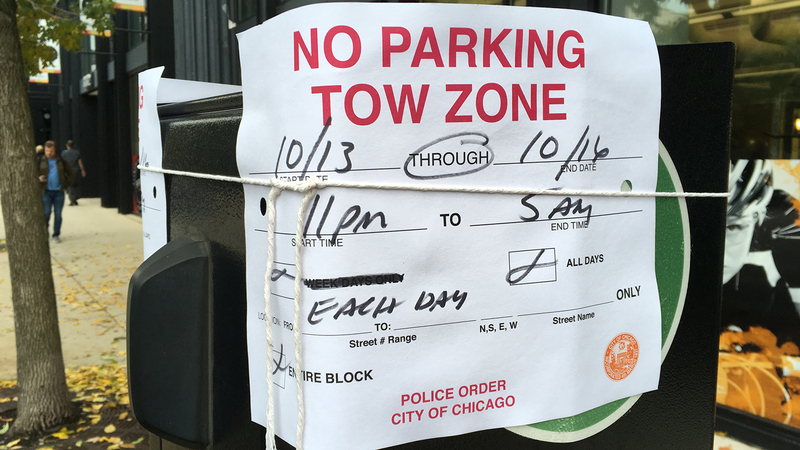 It’s a disturbing pattern: The city has issued duplicate tickets – and sometimes multiple tickets – on the same day, sometimes within the same hour, for the same vehicle violation. And the majority of those tickets are usually written in poor neighborhoods. In its investigative series “Driven Into Debt,” ProPublica Illinois and WBEZ found Chicago has issued 20,000 duplicate tickets since 2007. The pair who broke the story are Melissa Sanchez, a reporter with ProPublica Illinois; and Elliott Ramos, digital editor at WBEZ. They join us Monday in discussion. Below, an edited Q&A with Sanchez and Ramos. Is writing duplicate tickets for the same violation legal? Ramos: The city says they’re looking into it. Sanchez: The ordinance says you can be ticketed each and every day for this violation. And some city agencies interpret that as one per day as the max including the Finance Department folks who are out issuing tickets – that’s what they told us. But the city, after we brought this to their attention, is now asking the city attorneys to look closely at the ordinance to see whether they can, in fact, issue [multiple] of these in a day. They have not given us an official answer. They have not told us whether they’re going to toss the tickets or not. Is this a software glitch because multiple systems are being used? Are they going to fix that? Sanchez: They say they’re in the middle of a contract to upgrade the system that manages all of this ticket data, and that because we brought this to their attention, they’re going to look into ways to flag duplicates and then deal with them. At the moment, you’ve got some people like police officers writing tickets by hand … there’s no software that can check against [a handwritten ticket]. The Finance Department does it with handheld little computers, so that might change on the horizon. But at the moment, the city has not developed any way to flag these tickets – which is in a way kind of a joke because Elliott and I figure this out with just asking for the data and running the query. I’m sure the city has really smart technology people who can do this, too. Ramos: I think a lot of people kind of perceive – if you see that the parking enforcement aides on the street with the handheld devices – I think there’s a perception just because the stuff is electronic is that it’s advanced and that it does stuff like put time and date and then it goes into the cloud and stuff. It’s very antiquated technology; they still have to sync those up manually. It takes a while for it to get into the city’s computers. It takes a while for the police to enter the manual tickets, to do data entry, and then for all the stuff to go upward. But it seems, by and large, a lot of this is the city just kind of waits for this person to contest it and it’s kind of like the onus is on the person to contest it in traffic court as opposed to them flagging this stuff. What can a person do if they’re hit with multiple tickets on the same day for the same offense? Sanchez: You can contest tickets through the administrative hearings process. You could do that by mail. You can do that on the website or in person. The city says you can also call their customer service line if it’s like a ticket you think is issued in error and kind of bypass that system entirely. Ramos: The city hasn’t really advertised that [people can contest duplicate tickets]. It’s not just with this particular ticket but a lot of different types of tickets and violations. Sanchez: And what we’ve found when looking at who’s contesting the tickets is folks in more affluent, whiter areas are more likely to contest than some folks in lower-income areas, including Latino areas where there’s more immigrants. So yeah, many people don’t even know that this is one reason you can contest. Most of the time, if you do contest the tickets, the duplicates get tossed. But if you only have like one in six folks contesting, then the outcome’s going to be the people are either going to be paying for duplicates or in debt because of duplicates. What neighborhoods were hit the most with this practice? Ramos: Largely the South and West Sides. Sanchez: Neighborhoods like West Englewood, Woodlawn, North Lawndale, Englewood, Austin [have] the highest rates per household of these duplicates. Part of your story was about how the tickets are sending poor people into bankruptcy disproportionately. Can you expand on that? Sanchez: We found that over the past decade the number of consumer bankruptcies filed for Chapter 13 has exploded in Chicago. And tickets are a significant reason why that’s happening. This is happening nowhere else in the country. So sticker tickets, camera tickets, street cleaning tickets, the debt escalates. The tickets double if they’re not paid within a month or two. And then there’s a 22-percent collection fee tacked on. And as the debt doubles and increases, if people can’t pay it, there’s more penalties that come with it. The city will take your license away and without a license, it’s harder to get to work, to get your kids to school, etc. So, folks are sort of stuck: They’re unable to pay the debt. They’re unable to drive. And so bankruptcy has become, in Chicago, a temporary solution for thousands of people because bankruptcy gives you a legal protection that allows you to recoup a suspended license. So, as a result, you’ve got 10,000 people filing for bankruptcy last year in part to deal with the tickets. Ramos: And also, it is not just the fines itself. Like Melissa said, they suspend your driver’s license but also it escalates even further because they can then boot your vehicle if a certain amount of tickets are accrued. And then they can impound it and then you have to pay the impound fees. And then – actually one of the funny things is that, before you can get your car out of impound one of the things they check for is that you have an updated city sticker. And you still have to pay off the ticket debt and the impound fees. And sometimes if you can’t pay on time, they can actually seize your vehicle.